This walk begins in Par a town known for it's heavy industry but soon we head out over Par Sands and around the eastern edge of the sheltered St Austell Bay to the pretty village of Polkerris and on to Gribbin Head. 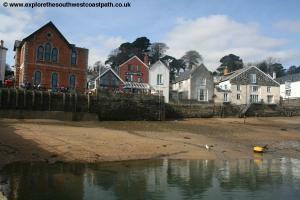 Once round the head the walk heads east to end at the pretty riverside town of Fowey. From the A39 join the A390 at the roundabout at the end of the Dobwalls Bypass. Continue on this road through Lostwithiel, following signs for St Austell. On reaching St Blazey, go over the level crossing and soon after you turn left onto the A3082 signed for Par. Follow the signs for Par station where there is a small car park (which may be for Rail Users only). Otherwise there is on-street parking available nearby or at Par Beach. If you are coming by public transport Par station has broadly hourly trains on the line between Plymouth and Penzance, with some through trains from London and from the Midlands and Bristol via Exeter. In addition there are direct trains from Par to Newquay on the north coast, running several times a day. Trains to Par are operated by Great Western Railway and Cross Country Trains. In addition, Western Greyhound run a bus service to Par from St Austell and Fowey. There is limited accommodation in Par. 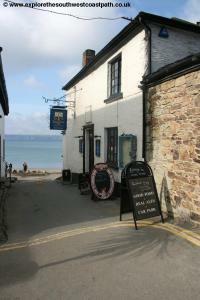 The Royal Inn, Par is a Bar, Restaurant and Hotel in Par which has 15 rooms available. 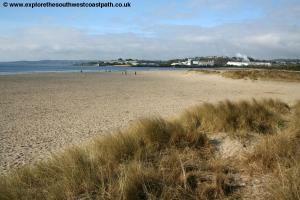 Par Sands Holiday Park offers self catering accommodation in Caravans or lodges which are at the back of Par beach. 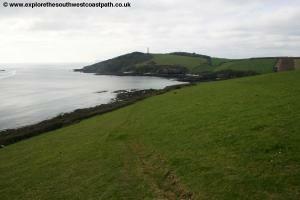 Otherwise there is a also accommodation at the end of the walk in Fowey. 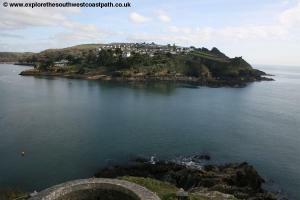 The Fowey Hotel is in Fowey and just off the coast path. From Par railway station follow the station access road and at the end turn right into Eastcliffe Road. A few metres down the road look for the stile in the fence to the right which you take to enter the recreation ground. Head diagonally across the football pitch towards the trees and cross the bridge that leads over a little stream. Once over the bridge turn left on the tarmac cycle and footpath and follow this until it joins the main road, Moorland Road. Turn right along the road and after passing about half a dozen houses on your left take the signed footpath between the house. This follows a tarmac path between houses to emerge onto Par Green. 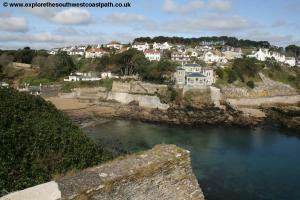 On reaching the road, turn left and after a couple of houses you turn right on the signed coast path. You follow this obvious path past the back gardens of the houses on either side and then with a wooded area to the right. Soon this comes to a private road leading to the works at Par harbour. 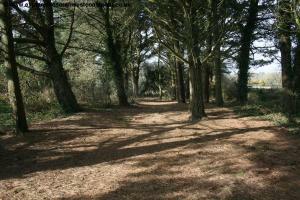 Cross this and once over turn right on the path through trees (not left, which leads only into a caravan site). Fork left when the path splits, leaving the trees and heading south west. When this comes to another track going left to right you have a choice of routes. 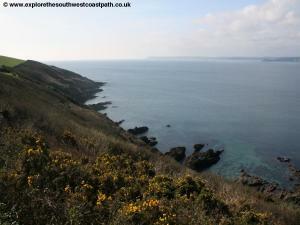 This is the official route of the coast path, which you turn left to follow. If you keep to the official route you follow this track as it soon widens to a road and passes along the south edge of the caravan site. Pass a lake on the left and after you pass the lake you come to the main Par beach car park on the right. An alternative walk which you may prefer is to when you join the main track behind the beach, soon take the first sharp right turn off it to come down to the beach and then walk along the beach to the eastern end of the beach. 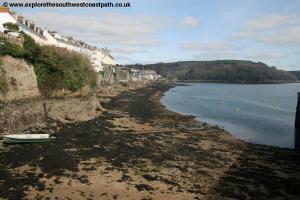 At the eastern edge of the beach you can take a path leading into the car park where the two possible routes join. Par beach itself is a good sandy beach backed by dunes although to the western end is the rather ugly China Clay works at Par harbour. The coast path continues from the far north east corner of the car park (the corner furthest from both the road and the beach), where you cross a bridge over a stream. Once over the stream turn sharp right on the signed coast path running along the top of the low cliffs over the western edge of the beach. 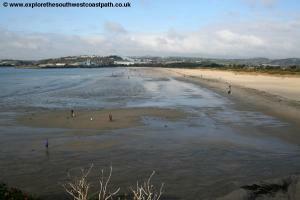 There are fine views over Par beach here and as you head further south views soon open up the whole of St Austell Bay. 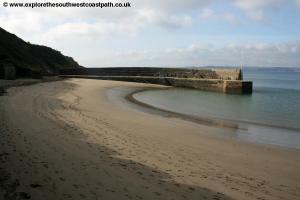 Soon you pass the back of another small beach, called Little Hell and then soon a larger beach just west of Polkerris. The coast path goes along the cliffs at the back of the beach, but there is also a path off to the right that leads down to the beach if you wish to visit it. Keep to the main coast path along the field edges until you briefly enter woodland and take the steps down to Polkerris. Polkerris is a beautiful little village and like many of the villages on the Cornish coast has a small harbour (at the southern end of the beach) and a narrow steep street leading down the centre of the village. You enter the village via the car park of the pub, the Rashleigh Inn which is literrally at the back of the beach and offers wonderful views over the beach and nearby coast. From the far end of the promenade along the back of the beach you take the signed coast path up on a steep zig-zag path up from the beach through woodland. When you emerge from the trees you turn sharply right to walk parallel to the edge of the trees on your right. 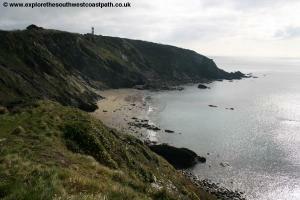 You now follow the easy cliff top path along fairly low cliffs with a few small (but inaccessible) sandy beaches. 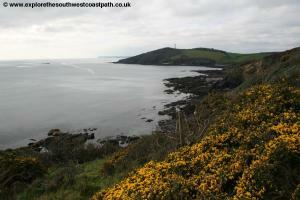 As you near Menabilliy Barton the coast path goes a little back from the cliffs through an area of gorse. Soon you reach the little headland at Little Gribbin and keep with the coast path along the cliffs at the back of a small beach. 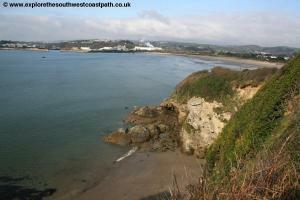 Continue on this main coast path around the back of a second beach, Platt. 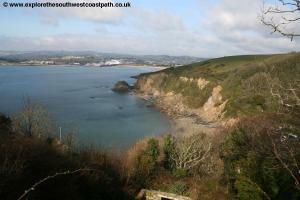 Soon you have trees just to your left and continue on the coast path along the cliff top. 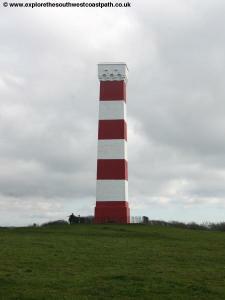 Soon you come to Gribbin Tower, a red and white painted tower. This acts as a navigation beacon for ships to identify which headland this is. The official coast path turns to the left here, passing right by the beacon and rejoining the cliff top on the eastern side of the headland. However an alternative route goes out to the headland rather than cut this corner off, which is recommended and this route briefly goes through woodland on the eastern side of the head. Whichever route you take you continue on the obvious coast path along the eastern side of Gribbin Head which now offers fine views to the beach at Polridmouth ahead. Soon the path descends down to this beach, which is really two adjacent sandy beaches seperated by a small rocky area, which the path goes along the top of. At the second one is a very well kept path and you must cross on the stepping stones over a stream that flows out over the rocks here (this smart house has it's own wooden bridge over the stream, but this is private). On reaching the eastern side of the second beach you take the obvious path up away from the beach and through trees, where there is a National Trust sign. East from here the coast is more undulating and you soon follow the cliff top path above Lankelly Cliff and Blackmore Beach. 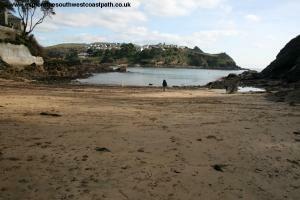 Soon you come to the sandy beach at Coombe Haven which is accessible if you want to explore the beach. 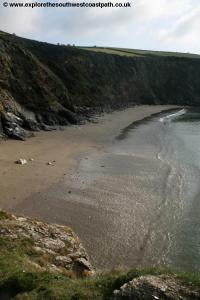 Continuing from this beach you take the path up and back along the cliff top. 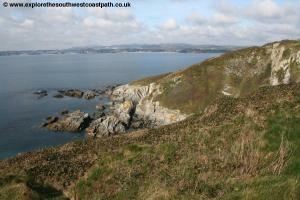 A path off to the right goes to Fowey Lighthouse, unusually a low lighthouse that is painted red. 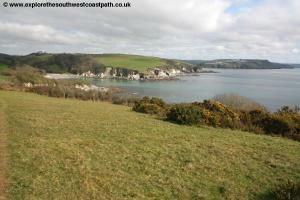 Continue on the main coast path behind a second beach, Penventinue Cove. 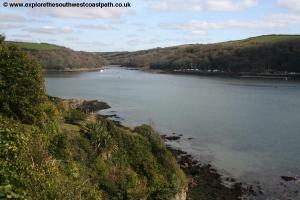 You are now approaching Fowey, with Polruan on the other side of the river. Ahead the path turns left, although there is a low path that leads to a small castle, St Catherine's Castle. This is open to the public and there is no charge. 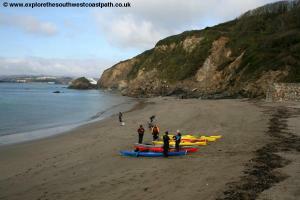 Return to the coast path and it soon descends down to Readymoney Cove which has a few facilities at the back of the beach and is a good sheltered sandy beach with rocks on either side. 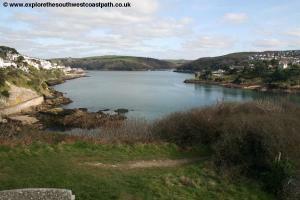 The coast path from here is to just follow the quiet road along the coast soon with the houses of Fowey on the left and later on the right as well. 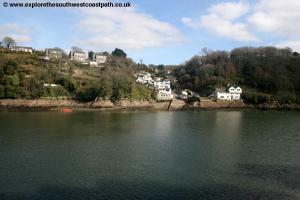 Fowey is a very pretty town with a sheltered location at the mouth of the river Fowey. You continue on this road until it comes to the harbour and quay. 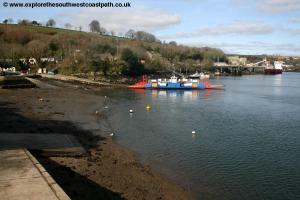 The passenger ferry leaves from this quay for Polruan in the summer. In the winter it goes from a point a little further north. Keep ahead on this road (Esplanade), past some fine houses, to reach the town centre where this road comes to an end at Loswithiel Street. 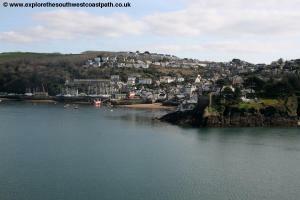 The town centre is to the right here, as is the point where the Polruan ferry departs in the winter. Turn left here up the hill to come to the Safe Harbour pub from where the buses back to Par depart. Western Greyhound bus services 524 and 525 run twice per hour from Fowey back to Par, Monday – Saturday. They run slightly different routes to Par but both take around 10 minutes to get back to Par. Both routes serve Par station and continue on to St Austell. On Sundays the service is hourly, alternating between the 524 and 525. The buses depart from outside the Safe Harbour pub at the top of Loswithiel Street. 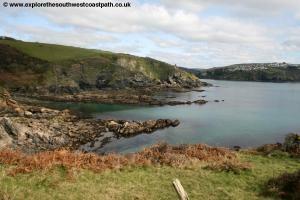 Ordnance Survey Landranger map 107 covers the coast between Par and Fowey and is available from bookshops nationwide.